"...In April 1972, members of a U. S. Army Special Operations group (in Cambodia during Vietnam war) were involved in a fire fight with the occupants of an identified alien craft. There were several alien casualties and a single human death, although several were burned by an unknown weapon." To be more computer-friendly, the reprint has been divided into parts. Here begins Part 12 of Status Report VI, from July 1991. These status reports were written by Leonard H. Stringfield from 1978 to 1994. Previous Status Report VII begins at Earthfiles 12/15/03. Leonard Stringfield died on December 18, 1994. 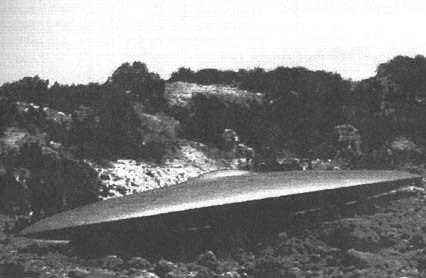 Computer simulation based on memory of a military officer who alleges he saw a photograph of a crashed saucer near Farmington, New Mexico on file at a military base library open only to personnel with Top Secret access clearances. From Chuck Oldham's 1991 interview with the unidentified officer.